Since moving out east, I’ve been a regular visitor to California about ever other year, but I’ve been thinking a lot more about California recently. 2019 marks the year that I’ve lived outside of California longer than I’ve lived in it. It’s the 15 year anniversary of my father’s death. It’s the year I went out to show Little Miss Cleaver my hometown for the first time and to see my mother for what is likely the last. I came back from my most recent trip with two shoeboxes full of family photos. I’m feeling a little nostalgic to say the least. So, as is only natural for a creative, I’m digging into that nostalgia and reflecting on the Golden State in my designs. Exploring bits of my person history and the history of the state at large, considering how the 31st state in the Union shaped me and shaped the country. There’s a lot to mine there (pun intended!) and honestly, a lot of emotion, so instead of trying to pull together a collection with a set deadline, I’ll be working on this project over the course of the year, releasing things as they are ready and telling the story in bits and pieces as I go. 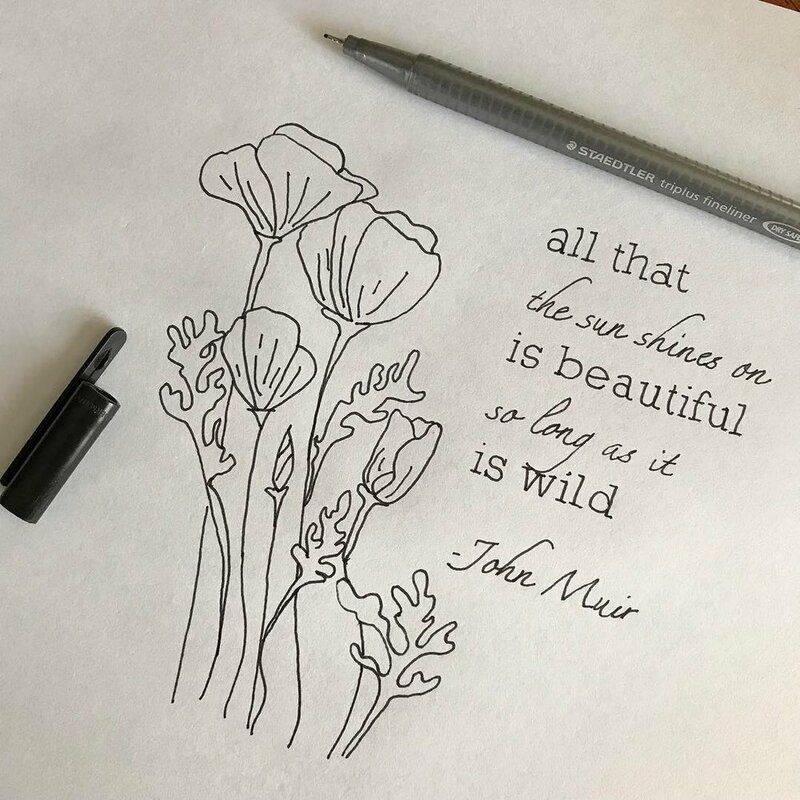 When I chose to focus my next batch of designs on the Golden State, I knew that John Muir was going to show up somewhere. My dad and brother, both Eagle Scouts, were/are outdoorsy people with a particular love of the Sierra Nevada, so I grew up well acquainted with the legacy of Muir and once visited his homestead when my brother was doing research for a school biography project. Muir was a prolific and often poetic writer, and this quote from a state promotional brochure published by the California State Board of Trade, particularly struck me in several ways. It is important to examine the full impact, both positive and negative, of the people and places we respect. I look at this quote and it serves as reminder to me that there is beauty in all nature (which I take to include all life, including human and animal), but also that we can overemphasize an unrealistic idea of “wild” - since there are very few places not impacted by humans and that not all human impact is negative. It’s part of reason I chose a brown for the text rather than a sharper black, because not everything is black and white. It was only natural to pair the text with the California Poppy - the state flower that grows wild in profusion in the state. The design is available as a complete kit, printed panel, or PDF pattern in my shop. As a small acknowledgement that there were many other residents of California before the Americans arrived, a minimum 15% donation of profits from any Golden State collection item will be donated to charities that support self-determination and community/economic development led by and for Native Californian and Latinx peoples, including the Seventh Generation Fund for Indigenous Peoples and the Dolores Huerta Foundation. It’s no secret that I learned to sew long before I learned to knit, and I still love them both, but while sewing is essentially the art of taking a flat piece of fabric and manipulating it into a 3-D structure, the magic of knitting is that you can work that structure into the very fabric itself. The simplest example of this is knitting in the round - rather than knitting a flat piece and seaming it into a tube, you just make the tube to begin with. Similarly, increases, decreases, and short rows can be used to form curves and undulations. I love designing my stuffed animals in the round, because it forces me to think in three dimensions from stitch one. But when it comes to garments, I’ll admit to finding a bit of a thrill in translating traditional sewing techniques, like pleats and pintucks into knitted forms. Just like with sewing, working a knitted pleat involves securing folds in the fabric. To work a horizontal pleat, like in my Bob & Wave Cowl (see bottom of post), you pick up and knit a stitch from several rows down together with every active stitch. The vertical pleat, as used to shape the hands of the Turning Leaf gloves, is worked across two rows and is a tad more involved, so I’ll walk you through the process step by step. Here I use the the term “tuck” to cover pintucks (which are very narrow tucks) and any other vertical pleat. The Turning Leaf Gloves (used as an example here) have a series of three tucks across the back of the hand. The tucks start at three stitches wide near the wrist, and then decrease to a two-stitch tuck, and then one-stitch tuck just below the fingers. I’ll be showing the three-stitch tuck throughout, but the same technique can be applied to a tuck of any width. A tuck with more stitches being folded will be more visible and decrease more fabric. In the image above, I’ve already worked four rows of the three-stitch tuck pattern. You can see the three tucks, and the four recessed “channels” that fall on the sides of the tuck. Worked over two rows, the tucks are formed by slipping the tuck stitches on every other row and pulling the working yarn very tightly across the back, which pulls the stitches on either side of the tuck closer together, essentially folding them and holding the fold together. Knit to the start of your first tuck. Tension the working yarn tightly as you work the first stitch post-tuck. The more snugly you work the stitches together on either side of the tuck, the more visible your tuck will be. Continue knitting normally until you reach the next tuck. Repeat steps 2 and 3 until you reach the end of the tuck section. In the example shown, the tuck section is 11 stitches wide: three tucks three stitches wide, plus one spacer stitch on either side of the center tuck. When you finish working your first row of tucks, you should have nine stitches (width of tuck x number of tucks) on your spare needle (or needles, if your tuck is very wide). Pick up and knit the tuck stitches (here, three stitches) off the spare needle. Knit normally to the next tuck. Repeat steps 2 and 3 until all stitches are back on the main needle. It will take a couple of rows until the tucks start to look like anything on the right side of the fabric. On the wrong side of the fabric, you should clearly see where the working yarn has held behind the slipped stitches. Try to keep that horizontal line the same length for tucks of the same width, and the short it is, the more prominent your tucks will be. Try out the pattern below which incorporate tucks, horizontal pleats, or smocking! My mother was an elementary school librarian, so my childhood was filled with all sorts of children's literature modern and classic. The Storytime Collection draws it’s inspiration from some of my favorite pieces of classic children's literature and might include some of your favorites too! The collection, which includes a sweater, gloves, two embroidery designs and a sewing pattern, is available as kits, pattern bundles and stand-alone patterns and has projects suitable for beginners to more advanced makers. The Saggy Baggy Elephant, Tawny Scrawny Lion, Poky Little Puppy – since the first Little Golden Book was released in 1942, these titles and many more have become classics read by multiple generations. Inspired by the iconic spine of Little Golden Books, a long band of colorwork forms a statement collar on an open-front cardigan. Knit from the top-down, the pattern uses the contiguous method to form a well-fitting one-piece yoke and is finished with clean folded hems and deep pockets. The pattern is available in bust sizes up to 56.5"/143.5 cm and includes helpful fit tips throughout the pattern to get the best fit for your body. Can be purchased as bundle with the Turning Leaf Gloves. In the early days of publishing, a sheet of paper with printing on both pages/sides was commonly referred to as a leaf - a less popular usage now, but one that lives on in phrases like “to turn a new leaf, ”loose-leaf” paper, and the French word feuille. The Turning Leaf gloves were inspired by the gilded leaves of hefty leather-covered tomes (be they the Bible or The Wonderful Land of Oz), this inspiration reflected in graceful pleats that shape the hands of these vintage-style gloves. Gloves are worked from the cuff to the fingers. The cuff is worked flat, with the hand and fingers worked in the round. Can be purchased as bundle with the Goldenbook Cardigan. Is there anything better than cozying up with a good book? The Little Readers are vintage-inspired designs that use a single color to create a strong outline, a technique known as redwork (or bluework, depending on the color). The paired-down design is a great introductory project for beginning embroiderers and would make a wonderful gift for the book-lover in your life. Named for The Music Man’s Marian The Librarian, the Ms. Marian Pillow turns your hoop art into cozy and beautiful home decor. Mitered corners and a checkerboard band increase the elegance of the design, which is suitable for intermediate sewists. Instructions are included for a standard envelope pillowcase and a tote-able reading pillow with book pocket. The sewing pattern includes template/pattern for both Boy and Girl Little Reader embroideries and is a perfect companion to any of my 6” hoop designs or kits. Not into embroidery? Use the center panel to display an 7” square quilt block or panel of a favorite fabric. The Ms. Marian Pillow Kit provides you with all the materials (minus pillowform) to make one beautifully embroidered, library-themed pillowcase. You can choose to sew it up as a standard envelope-back pillow, or (my favorite) as a tote-able reading pillow with book pocket. One of the most fun parts of being a designer is seeing how others interpret your designs. We’re in October already, leaves are starting to change color, which means we are entering peak knitwear season! Instead of the most recent FOs this go round, I thought I’d share some of my favorite of your autumnal knits. Click on any image to visit the maker's Instagram or Ravelry page! Leading Bird Shawl by Mindful Folk in her own yarn! Hemingway (Men's) by karencampandknit (pattern available via Twist Collective). Want to make one of your own? Grab the patterns below! While browsing at my local yarn shop earlier this year, I came upon three colors of Juniper Moon Farm's Zooey piled together in a cubby and thought- what perfect New England colors for summer! When I got it home and placed my purchase next to some Moxie packaging, I realized that it was the perfect Maine summer colors. And so, inspired by the colors of Moxie soda, the official soft drink of Maine, the Moxie shawl is the perfect knit to both make and wear at the beach – whether your beach is in Maine or lands beyond. Moxie is a traditional top-down triangle shawl that uses a mosaic knitting technique for the colorwork bands. Mosaic knitting creates patterns by using slipped stitches that pull up a strand of color from the row below, which means you're only dealing with one color in each row and getting a graphic "pop" with little complication. Worked in garter stitch, the shawl is a quick and cozy knit. The Moxie pattern can be found in GRAIN - the current issue of Taproot Magazine, available via subscription, their online shop, and at a variety of bookstores and stockists. A very special thanks to my testers and to Aimee Chapman for some short-notice modeling! We're already halfway through August, which means that I've already got holiday crafting on the brain (not that I'll start on it for months yet, but I'm thinking about it...). For those of you who are a bit more forward-planning, my 2018 holiday design, Chickadee and Pine is now available, along with all my other wintery-woodland designs, to get a kick-start on that crafting. I've also got something else new that I'm super excited to share with you - my first sewing pattern! The Ms. Billingsley Apron (named for June Cleaver herself, Barbara Billingsley) is the answer to the question "but what do I do with the embroidery after I've finished it?" Designed to fit any of my 6" hoop designs, the easy-to-sew, but elegantly finished Ms. Billingsley apron can also be used to show off a single quilt block or panel of a favorite fabric. You can find the pattern as a downloadable PDF (complete with Bowl of Cherries template), or I've assembled some kits featuring the sample fabrics shown above paired with a Bowl of Cherries complete embroidery kit. Meet Nerio, my latest (and 21st*!) release with Quince & Co. yarns. These quick-knit socks feature a deceptively simple lace pattern reminiscent of dragon scales. Toe-up construction with an afterthought heel keep the knitting flowing so these little beauties will practically hop (or should I say fly?) off your needles. Ravelry | Ms. Cleaver | Quince & Co.
*And the third to be styled with that skirt! Is it possible to be nostalgic for a life you've never lived? My idea of the perfect summer, for better or worse seems to be heavily colored by Country Time Lemonade commercials and reruns of the Andy Griffith Show that both played in heavy rotation during summer mornings in the late 1980s - I think summer should be swimming holes and floating docks in lakes and, yes, inner-tubing (with real tire inner tubes) down a lazy river. I can only recall actually inner-tubing on a real river (instead of, say, at Raging Waters) once - but I wouldn't mind kicking off my sandals, and going for a long float down a shady river. Until that opportunity pops, up I'll content myself with this trio of stitched ladies acting as my proxy. Want to stitch up your own lazy summer? 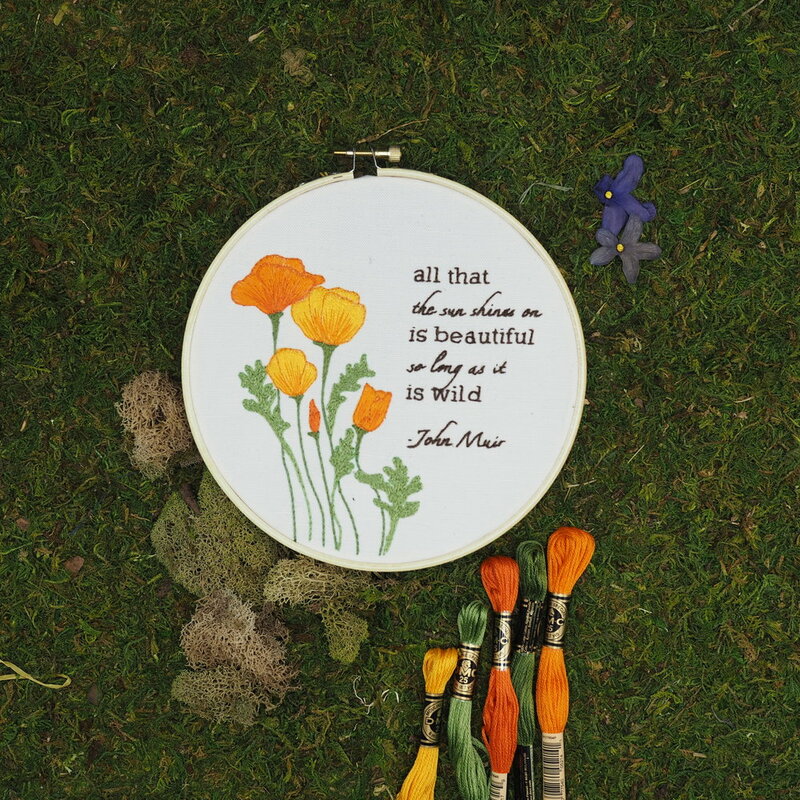 Pick your favorite floating beauty or stitch up all three for a summery triptych - each kit comes with a range of five hair tones (silver, blonde, red, light brown, and black) and three skins tones (light, medium, and dark) to personalize your hoop art.